A potentiometer is an instrument used to measure an unknown e.m.f. which is compared with known e.m.f. thus it is a device used for measurement of unknown e.m.f. is compared with a known e.m.f. The known voltage may be supplied by a standard cell or any other known voltage. Measurements using comparison methods are capable of a high degree of accuracy because the result obtained does not depend on the actual deflection of a pointer, as is the case in deflection methods, but only upon the accuracy with which the voltage of the reference source is known. Another advantage of the potentiometer is that since potentiometer makes use of balance or null condition, no current is flow and no power is consumed in the circuit containing the unknown e.m.f. when the instrument is balanced. Thus the determination of voltage by potentiometer is quite independent of the source resistance. Since the potentiometers measure the voltage, it can also be used to determine the current simply by measuring the voltage drop produced by the unknown current passing through a standard known resistance. The potentiometer is extensively used for a calibration of voltmeters and ammeters and has in fact become the standard for the calibration of these instruments. For the above mentioned advantages the potentiometer has become very important in the field of electrical measurements and calibrations. The principle of operation of all potentiometers is based on the circuit of figure, which shows the schematic diagram of the basic slide wire potentiometer. With switch S in the operate position and the galvanometer key K open, the battery supplies the working current through the slide wire and the rheostat. We can vary the current by adjusting rheostat. 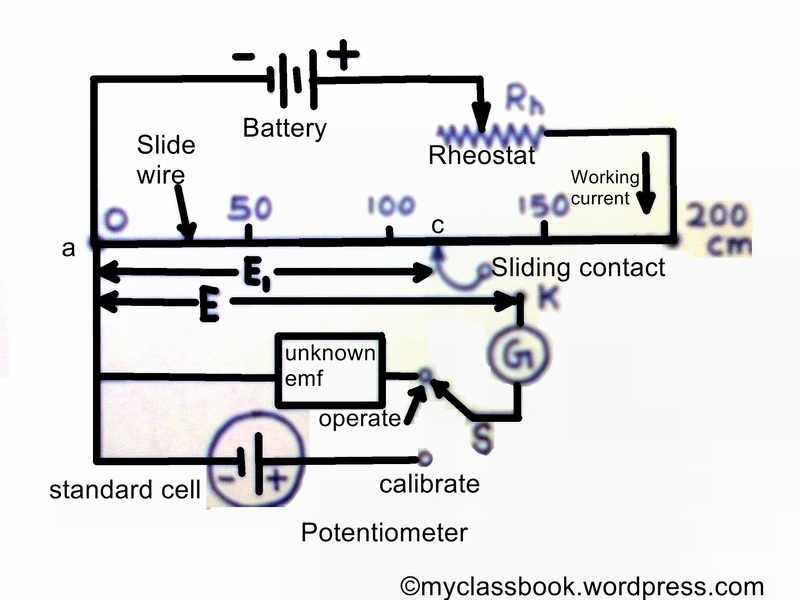 The method of measuring the unknown voltage E depends upon finding the position of slide wire such that galvanometer shows zero deflection. It means unknown voltage E equals to the voltage drop E1 across the portion ac of the slide wire. The slide wire has the uniform cross-section and hence it has uniform resistance along its length. Slide wire consists of cm scale along its length. Since the resistance of the slide wire is known accurately, the voltage drop along the slide wire can be controlled by adjusting the value of working current. So knowing the value of unknown voltage E and working current I, we can calculate resistance using the formula R=V/I.